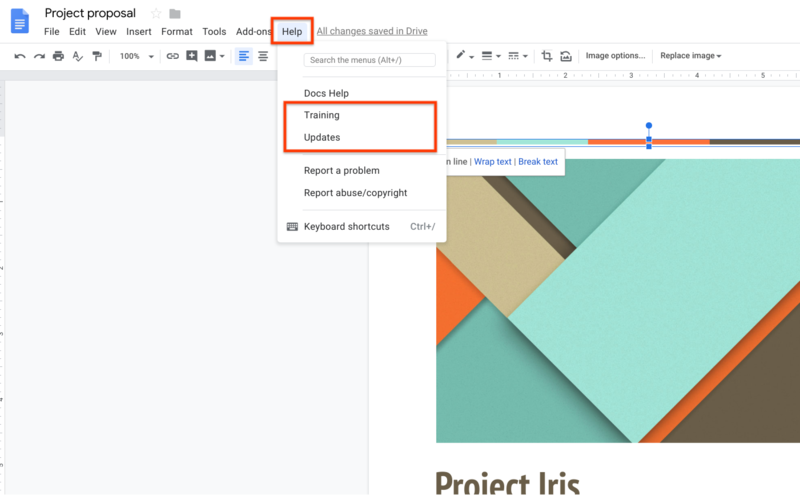 A new button in Gmail, Calendar, and Drive: A new ‘?’ support button next to the search bar at the top of Gmail, Calendar, and Drive on the web will provide quick access to a range of help and support content. New menu options in Google Docs, Sheets, and Slides: The Help menu in Google Docs, Sheets, and Slides will have "Training" and "Updates" options added. In any Docs, Sheets, or Slides file, access the Help menu for the new Training and Updates option (see image below). A new support icon in Gmail, Calendar, and Drive. New options in the Help menu of Docs, Sheets, and Slides. Scheduled Release domains: Gradual rollout (up to 15 days for feature visibility) starting on April 17, 2019.